You want a 4K but you also want to be sensible with your money? We understand completely. 4K TVs are all the rage right now, with advancements in camera technology, video game development and detailed visual effects, you need a good TV to experience up-to-date content. Theres never been more lifelike imagery in movies and television nor more detailed worlds replicated in video games. These industries have changed dramatically in the last ten years or so and are continuing to change as we speak. Can You Get a Good TV Under $500? You can still consume all of this advanced content on an older, less capable TV but you wont get the full experience, youll be missing out on an awful lot of detail and realism. Big problem though, these TVs arent cheap. The absolute best 4K TVs will cost you well over $1000 and thats just too much for most people. But dont worry about that, because with a bit of research, youll find that you can get a great 4K TV for less than $500. With that in mind, lets have a look at four of the best ones. 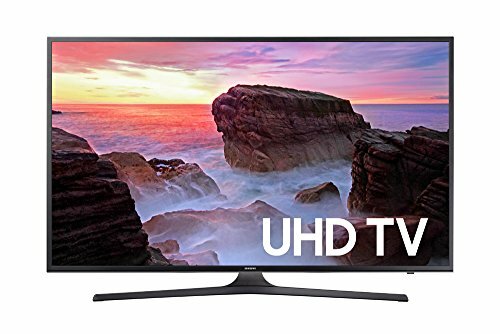 There are also some great TVs for less than $300. Got more of a budget? Try these amazing 4K TVs which cost less than $1000. 4K Ultra HD TV screen with Ultra Dimming technology. An excellent HDR system with Essential Black Pro too. Many inputs and outputs including 3 HDMI ports. Advanced color mapping with True Color Accuracy. High Motion Rate for action and sports fans. Before we go into detail on each of these products and their individual features, we would like to confirm that all of our products have an Energy Star rating of 75 or higher. What this means, is that your TV will be more energy efficient and by extension, will be more cost-effective too. These products arent going to be sending your electricity bill through the roof, which is hugely beneficial. Now then, on to the TVs. If you've been looking for a 4K TV for a while, the fact that a Samsung product has made it here as our Top Pick should come as no surprise. 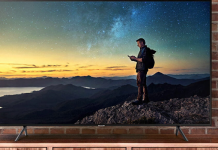 Samsung makes a huge variety of 4K TVs to buy at a wide range of price ranges and sizes. So they have several good ones that are less than $500. This 40inch 4K TV is the best one in our opinion. It's got Ultra HD local Dimming which means that different areas of the screen can be lit individually which makes for excellent contrast. The Motion Rate is 120 which will serve any fast-paced content you want to watch very well. The TV has HDR Pro, probably the best version of HDR available and it's also a Smart TV. 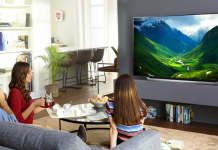 Like most Samsung Smart TVs, it comes with the very useful Samsung OneRemote which allows you to access any app on the budget TV as well as any device that's connected to it. + 4K Ultra HD TV screen with Ultra Dimming technology. + An excellent HDR system with Essential Black Pro too. + Smart TV and OneRemote. + Many inputs and outputs including 3 HDMI ports. 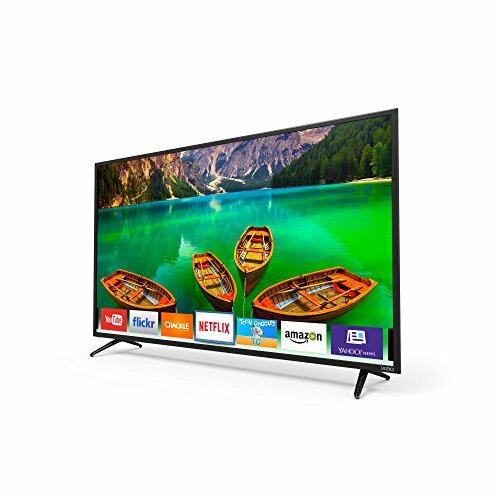 Why We Liked It - Its just the best 4K TV that you can get for this price tag. 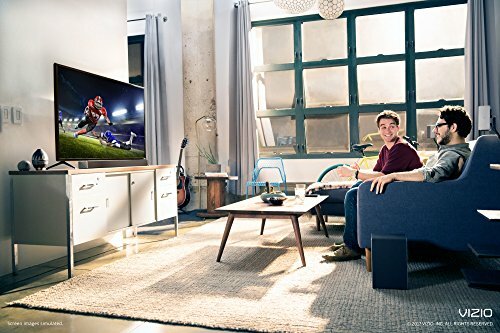 It does everything that you could want out of a 4K TV and is actually just as good as a lot of the more expensive models, some that are even worth thousands of dollars! For cheaper TVs, see this review on TVs under 200 dollars. LG is another company that produces many amazing TVs and as a result, is one of the leading names in the field. They're willing to experiment quite a bit with their products and while sometimes that doesn't work so well, their TVs are usually pretty top-notch. This great 43-inch TV is no exception. It's 4K UHD of course, and it brings HDR to another level with Active HDR. This technology changes and adapts HDR optimization based on the content of the picture. 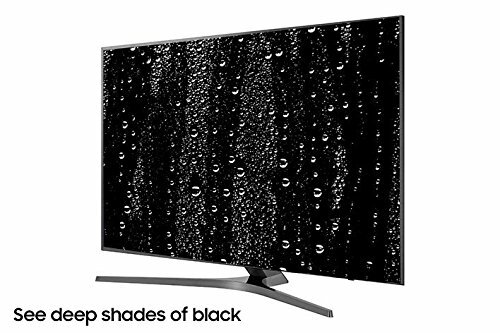 This 43-inch 4K TV will automatically react to images of different color and brightness to ensure that every specific shade is the clearest and lifelike it can be. The Motion Rate is also strong with TruMotion 120 and it also has an IPS Screen. This will ensure that you get the full benefit of the picture no matter what angle you are viewing it from. + Revolutionary Active HDR technology. + Advanced color mapping with True Color Accuracy. + WEBOS 3.5 smart platform. Why We Liked It - The Active HDR is a huge advantage to an already outstanding picture and LGs WEBOS technology is just an added bonus. Looking for a bigger screen? 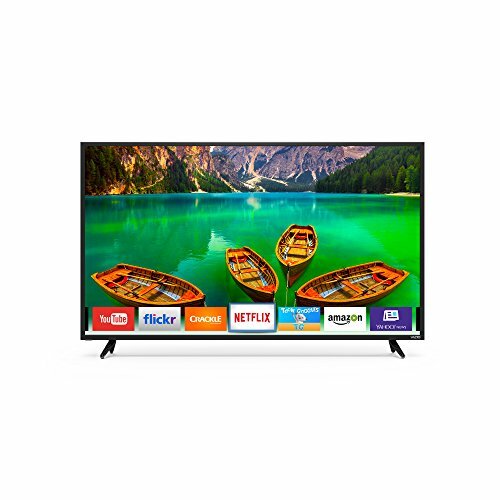 Try a top-rated 60" 4K TV here. At 55 inches this VIZIO model is quite a bit larger than the other two we've talked about but the picture quality does not suffer much for it. It is of course, a 4K Ultra HD screen and while it's not HDR, it does have a Full-Array LED screen. This is similar to HDR in the sense that it allows for a wide range of brightness, and although it's been around for a while it's still a reliable technology. HDR is slightly more advanced and does give the picture more rich contrast of color but LED is still capable of optimizing individual areas of the screen. The Motion Rate is nice and strong too, with a system known as Clear Action 180. With this Smart LED TV, you won't miss much detail if you're watching a battle scene in a movie or playing through an epic gunfight in a first-person shooter video game. It's also got smart compatibility and comes with VIZIO's very own smart platform called Internet Apps Plus. + High Motion Rate for action and sports fans. + Various inputs and outputs. 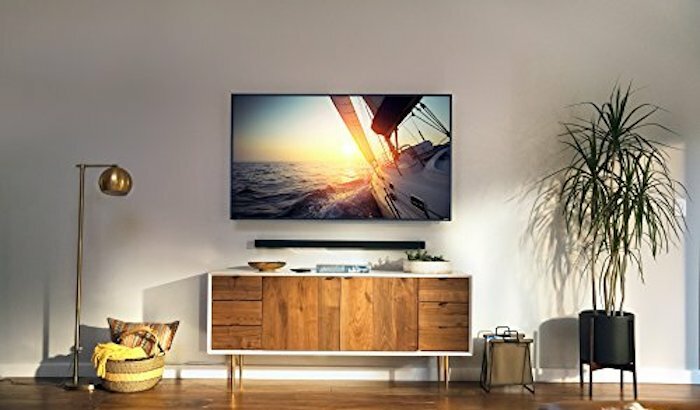 Why We Liked It - Although this VIZIO 55inch 4K TV lacks the advantage of HDR, this VIZIO model still has an outstanding LED picture quality and a user-friendly smart platform, which makes it great value for money and perfect for home theater. 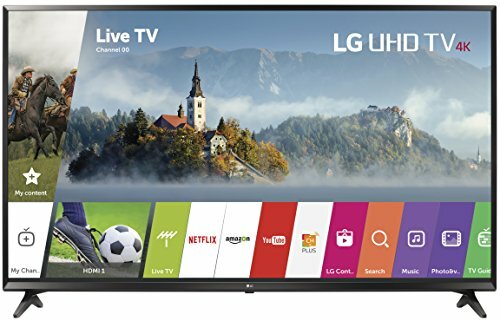 Yet another affordable LG TV that is very much worth considering. 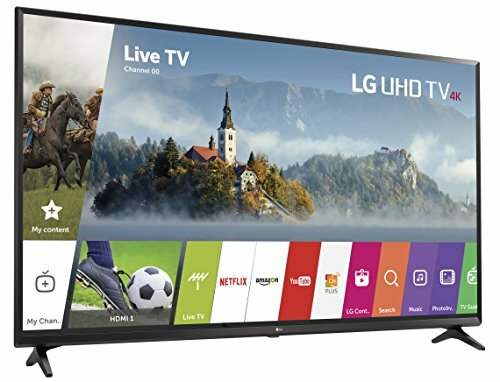 This one is actually very similar to the LG model that we have listed at number 2, but with a LG 49-inch 4K resolution screen instead of a 43-inch. So the reason why this is one is lower is that putting the same specs on a larger screen puts more pressure on the hardware and as a result performance can be affected. But aside from that, this LG 49-inch 4K is still a great budget TV. This fantastic 49-inch television has got everything the other one does, so the 4K UHD is here, as is that awesome Active HDR. It's also got LG's handy smart platform WEBOS. WEBOS is a system that, among other things, makes every app and connected device easily accessible from the life menu. It's easy to switch between things and to find things so this is a great smart system to have. There's also no shortage of inputs and outputs including a total of 3 HDMI input ports and a 2 USB ports. + Can be viewed from any angle thanks to the IPS screen. + WEBOS 3.5 is a fantastic smart platform. + TruMotion 120 makes every fast-paced scene as smooth as possible. Why We Liked It - This LG 49-inch 4K TV would be a great choice. Its got a large screen with a lot of different features that come together to make a beautiful picture. You may also be interested in these cheap 50-inch TVs for under $500. So some great choices there, each one with something else to offer that the others don't have. These differences are important they'll be important to you when you're making this decision. You're the only person who truly knows what you want to get out of your cheap 4K TV for your home theater. 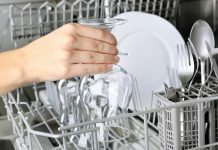 They serve a variety of purposes and different people want to use them for different things. Some people might want it exclusively for movies and television and as such probably wouldn't need to worry about more game friendly aspects. Someone might just want a TV to play HDR games on, or maybe someone wants it exclusively for sports. And these days, with smart compatibility, the possibilities are endless and there are many uses that people could be potentially putting their TVs too. So for whatever reason you have, there's going to be a right TV and to find out which one, there are several different things that you need to consider. Let's talk through some of these features now to get an idea of which budget TV you should pick. You may have seen this as it's more commonly referred to, by the abbreviation HDR. High Dynamic Range is a popular feature that most of the modern televisions come equipped with. 4K resolution and HDR tend to go hand in hand and the two technologies complement each other very well. So the function of High Dynamic Range is to increase the range of brightness that the TV can display. This won't make everything obnoxiously bright and shiny but what it actually does is make sure that the resolution is not negatively affected by how bright or dark the imagery is. The tiniest details will be as visible and prominent as intended. I'm sure you've noticed it on older TVs or just TVs in general that lack the HDR functionality. If you're watching a scene that's particularly dark, you can't really see any of the intricacies in the background. Everything is murky and pixelated because those colors are not being optimized. This is not the case with an HDR TV. There will usually be a feature of HDR to deal with very dark content like Triple Black Technology or Essential Black Pro. These features ensure that darkness will have the same level of clarity as everything else that appears on the screen. And the color accuracy and contrast won't suffer for excessive brightness either. HDR always comes equipped to deal with every shade imaginable. Its a brilliant addition to have and its also well worth it for video games. As weve said a couple of times, video game technology has come a long way too. Youve got a lot of massive open-world HDR games being released right now and theres usually some quite detailed environments for you to explore. Video game developers are taking full advantage of the technology and filling their worlds with as much 4K content as possible. You dont want to miss a single second of it. It's worth noting that HDR comes in two different systems. You can get HDR10 or Dolby Vision. HDR10 is the more common of the two, with Dolby Vision not often being found outside of the most expensive products. It stands to reason then that you won't get Dolby Vision in a TV less than $500 but it doesn't really matter much, especially if it's video games that you want to use the budget TV for. Current generation PlayStations and Xboxes both use HDR10 as their output so getting a Dolby Vision 4K TV for gaming is pointless. So again, HDR is something that we recommend but it's not absolutely essential and it might not be something that you personally think is important. So like everything else we'll discuss in this section, whether you choose HDR or not is up to you. So we've talked a little bit about Motion Rate already but it's probably not entirely clear to you what it actually means. Essentially Motion Rate refers to the response time and refresh rate of the picture. So it's how quickly you can expect the TV to react to movement which will determine the image quality of fast-moving scenes. It's something that you've probably never really thought of as a potential problem while watching, but if the Motion Rate response time and refresh rate was insufficient you would definitely notice it. 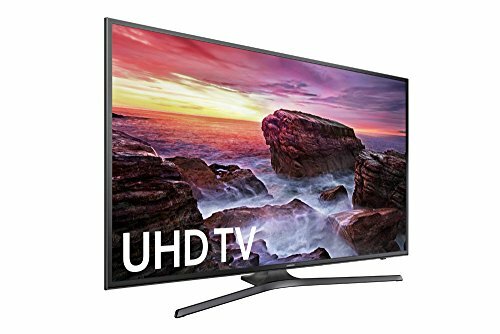 When it comes to cheap 4K TVs to buy on Amazon, you'll probably find that the majority of them are aware of the importance of this factor. Very few 4K resolution screens will come with a Motion Rate less than 120. If you happen to find a TV that has less than that, I would avoid it at all costs. A Motion Rate of 60 for example, is just not going to cut it for 4K content. The ideal system would be Motion Rate 240, but that's usually reserved for more expensive TVs so since we're sticking with less than $500 here you probably won't be getting a 240 Motion Rate. That's not a huge issue though, 120 might leave you with a little bit of blurring on extremely fast-paced 4K content but nothing too problematic and distracting. So 120 is fine but we can't stress the importance of this enough. If you're watching an action movie that has any kind of high-octane action the Motion Rate will need to be strong to handle that. Especially nowadays with those advanced cameras that we talked about earlier. They're picking up detail no matter how fast the stuff that's being filmed is and you don't want to miss a single second of that detail. It applies probably even more so to video games. There are some games that have a relatively slow, subdued pace but for the most part, gaming on a TV is all about the fast pace and the high-intensity. Call of Duty with a Motion Rate of 60 would be absolutely infuriating. So definitely dont ignore this factor, its one of the most important things to think about when buying a cheap 4K TV. LED TVs have actually been around for a long time, far longer than 4K HDR capable TVs. Surprisingly enough though, its not all that common of a feature in these modern products. This might be because its not exactly the ground-breaking technology that it once was anymore. 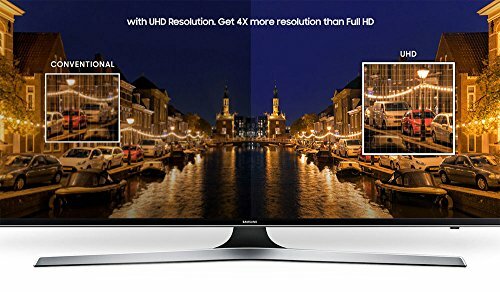 HDR does offer a relatively similar function and you could argue that its actually superior and removes the necessity for LED. This is up for debate and were not sure we agree entirely because each of the two systems has their own advantages. LED, which stands for Light-Emitting Diode, is usually used as a backlight for a TV screen. The smart LED panel is made up of several layers of tiny individual lights, that will light and dim independently of each other. You've probably heard the term ultra dimming', which is something that most LED TVs are capable of. This will allow for different areas of the screen to brighten and dim at independently of the entire panel. It's an extremely useful feature to have and it can help effectively convey a particular image that has a large contrast of brightness. See these amazing 40-inch LED TVs. Of course, HDR is similar as we said but HDR doesn't achieve this by use of a backlight panel which means that the brightness might not be as under control as the picture quality of the colors. So in a way, the difference between an HDR screen and a smart LED screen would be noticeable but which one is better is a question that will come down to your personal preference. Another thing to note is that there is a new technology these days called OLED. The O' stands for organic, and it means that the smart LED panel is made entirely of organic material. The benefit of this is both that it's more energy efficient and that OLEDs are much smaller and more flexible than regular LEDs. The difference in image quality is pretty astounding between the two. Currently, OLED TVs are pretty rare with LG being the only ones producing them. It's also unlikely enough that you'll find a TV under $500 with this capability. 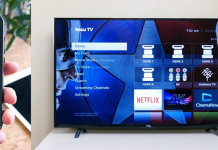 Smart TVs, much like smartphones before them, are starting to become the norm. We're not quite there yet but the prominence of smart compatibility in modern TVs you can buy online is constantly increasing. It's understandable too, there are so many advantages to having a Smart TV. The way we consume movies and TV shows these days is completely different from how it was even just a few years ago. Having an actual television provider was important if you wanted to keep up with your favorite shows or if you wanted to catch new movie released without having to buy the BluRay and BluRay player, but now a lot of that is on Netflix. Of course, you can get Netflix on any computer or you can download it onto a games console, but I think we can all agree that having Netflix right there, ready to access on your 4K TV is the ideal scenario. This is possible with a Smart TV, almost all of them come with the major streaming services already installed. Netflix, Hulu, YouTube, Amazon Prime video, they'll all be readily available on the home menu of most Smart TVs. And of course, there is a whole host of other streaming services out there nowadays. Many smart home networks have their own as do sports companies and news channels and pretty much all of them will be available from a Smart TVs App store. There's actually quite a few different things that you can get from the app store of a Smart TV. It's pretty similar to scrolling through the choices on a smartphone, there's useful stuff up there that you probably haven't even thought of. You can get HDR games, access to online stores, there are apps that offer tutorials on various things like cooking and exercise. There are tons of great things to do with a Smart TV that you'd never expect. And you could even use it just as a plain old browser. So we'd highly recommend picking a TV with smart compatibility. With it being such a common feature it's not going to bump the price tag up significantly and it's a very worthwhile addition. If you look at the four options that we've talked discussed, you'll see that this is probably not something that you should be hugely concerned about. Most of these companies are aware of the importance of having a variety of inputs and outputs and so they'll usually come with a few of each. You'll notice from these products and from most cheap 4K TVs that you research, that there is rarely a shortage of HDMI ports. These are extremely important if you want to use the TV for anything beyond just the terrestrial channels that everyone has access to. Three HDMI ports might seem like more than enough, but if you think about the streaming devices that youll be connecting to your TV, youll find that these ports fill up rather quickly. Firstly, you will almost certainly have a Set-Top Box. Usually abbreviated to STB, this is how you will access all of your channels. Even though streaming services are beginning to dominate how we watch our favourite shows and movies, most people still have the standard STBs in their houses too and thats at least one HDMI input. Then if you have a BluRay player thats another and one current generation games console is three. Most people will probably have at least two of these with a lot having all three, and potentially other smart home devices that may need to be connected via HDMI. So the necessity for them is definitely there. On top of that, USB ports are always beneficial if you want to connect something like an external hard drive and a lot of people would be looking out for headphone jacks or even composite drives if they want to connect an older device like a VCR. So if any of these are important to you make sure you keep an eye out for TVs that come with them. So as you can see, there's a lot of different things that you need to think about before making your final decision but as you can also probably see, there are several good choices. The thing is, and we know we've said this before but it is important, the right TV isn't the same for everyone. The Samsung model which is our Top Pick up there is a great TV and our favourite but you might personally be better suited to the smart features offered by one of the others. So what you should do is go through all of the different considerations we've discussed and decide what is essential for you. Anything that you absolutely must have with your TV and then decide if there's anything that you don't need. Then when you look at the products again, you can get a good sense of which of the TVs covers all of the important bases for you. Once you've done that, you shouldn't have much trouble choosing. We believe that Samsung is the best brand for cheap 4K TVs to buy for under $500. The Top Pick we have in this article is a Samsung product and is the best of the ones we researched. The Samsung TVs are packed with picture enhancing smart features and always have a dependable smart system with the handy OneRemote. Yes. There are many good choices for TVs under $500. There are certain features that usually don't come in cheaper TVs but they're usually things that can be expendable. You can still get a large variety of TVs that offer 4K, HDR, and smart compatibility for less than $500. If your TV is suggesting a firmware update, make sure you research the effects of said update before you install it. Usually, the updates are beneficial, but sometimes they have unwanted consequences that you can avoid if you check up on them. LG's WEBOS smart platform comes with a feature that can be enabled and disabled at will known as Auto Guidance. This will narrate your actions as you use the remote to navigate the smart menu. This is among the many brilliant features available now that make it easier for the visually impaired to experience Television.